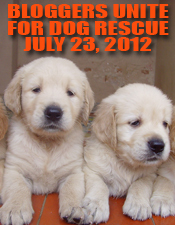 Today, July 23rd, in coordination with Be the Change for Animals, Dog Rescue Success and Blog Catalog, bloggers all over the world are blogging to promote the importance of dog rescue and adoption. It's probably no surprise to anyone who's read even just a few posts on the blog that I am a vocal (and active) advocate for shelter and rescue dogs. My Saturday's Dog series features dogs available for adoption through local shelters and rescues. Stories about rescue transports and adoption events make occasional appearances. Even the stray URGENT request to find a dog a new home can find its way in to a post. And yet, on this day of world-wide blogging to make a difference in the life of rescue and shelter dogs, I find I have no idea what I want to say. How can I talk to anyone about the joy of adopting a dog from a shelter when I'm writing a blog about how messed up my own dog is? I certainly would like to encourage anyone reading this post to consider getting their next dog from a shelter or a rescue organization. The HSUS estimates that animal shelters care for 6-8 million dogs and cats every year in the United States, of whom approximately 3-4 million are euthanized. In Puerto Rico, a U.S. Territory and Bella's homeland, of every 100 dogs that enter a municipal shelter, only 3 make it out alive. "Between 2 million and 4 million dogs are born in U.S. puppy mills every year." And I would like to dispel a myth about shelter dogs even though my own may seem to validate it. Myth: Shelter dogs are damaged dogs. 3) Too many animals in household. The vast majority of dogs I have met and worked with in rescue and shelters would make wonderful family pets. They are rigorously assessed for temperament. I have had as many as 5 dogs crated in my Subaru Forester without a hint of drama or reactivity. Several have given me kisses. Others have fallen asleep in my lap. Yes, some rescue/shelter dogs carry the emotional and physical scars of their history as Bella does. Bella's genetic hodgepodge indicates she is a street dog born of a street dog born of a street dog. Her instincts and sense of self-preservation kept her alive in impossibly hostile circumstances. She bears the scars of physical abuse on her back, malnourishment on her face and emotional trauma in her behavior. But Bella was deliberately chosen by us with full knowledge that she had 'issues'. No one at the shelter tried to pretend she didn't. They gave her to us because they knew me as a former volunteer. They knew my commitment and were aware of my handling skills. Every dog should be so carefully placed by the rescue/shelter and no dog should ever be purchased or adopted without a full understanding of the responsibilities required to appropriately raise a dog. The onus is on both the prospective owner and the shelter to see that through. As animal advocates, we need to work on multiple levels to help change the condition of our "best friends". We need to promote and subsidize spay/neuter programs. We need to work diligently to shut down puppy mills and over-breeding for simple greed. We need to educate the public and we need to continue to save the lives of dogs who find themselves, through no fault of their own, homeless, abused, neglected and abandoned. Finally, I'd like to ask anyone looking to add a dog to their family to please consider carefully the commitment you are about to undertake. Before you adopt from a shelter or buy from a reputable breeder, please educate yourself. Dogs are not trifles. They are living, breathing, thinking, feeling, sentient beings who can live up to 15+ years. They are a commitment. They cost money. They have accidents, injuries and illnesses. They need to be taught and trained. And they need someone who is going to stick by them when the new baby comes or the furniture color changes. They require your time, attention and energy. And for all of that, they will give you nothing more than endless affection, devotion and entertainment. Let's try to do better by them, shall we? Share these posts across all forms of social media and encourage others to participate! I think underlining the fact of how much a commitment a dog is is very important. We can say to rescue and adopt, but only if you are ready because otherwise you are just perpetuating the cycle of abandoned dogs. Great post. I Iike your "bruised but not broken" tag. This was true of the last 3 dogs we adopted as well, though I think none of them could match Bella's history. In many ways, I think that people who CAN and have the experience might WANT to look at picking up the more bruised ones because that would be the dogs' best chance of making it. And what a joy for the humans too when they are rehabilitated! It would be great if more people made the connection between 3-4 million animals being euthanized each year and the 2-4 million puppy mill dogs produced each year. Awful how those numbers tie, glad you found those stats. I have the same problem dispelling the myth that most shelter dogs have issues, since our 2 are complete project dogs. We picked Maggie and then Duke knowing full well they had fear issues. We were going to get a "normal" dog for Maggie, but Duke just clicked with her right away. It doesn't hurt that they're sort of a matched set! wonderful post and we are happy to see so many participating! You're right that so many shelter pets will fit easily into a new home. Our current foster, Cherie, fits into that category. But I think you demonstrate something else in your writing about Bella. And that is that even if something is hard that doesn't mean it's not worth doing. If you enter a situation prepared (as you did) and with a commitment to learn what you need to help a damaged dog, you're going to change two lives--your own and that of the dog you adopt. I certainly don't think everyone should take on a challenged dog just because there is a need. But it's those challenging dogs that transform our lives. Agatha did more to change my thinking about dogs than all the reading in the world. And i bet you'd say the same about Bella. Great post. And the lesson from Bella is not that no rescue dogs are damaged. But that even those with a terrible start in life can blossom into wonderful dogs who touch all who meet her (even if only online). I love the thought you put into this post, even though you didn't think you had anything to say. Bringing an animal into one's home is never something to take lightly, no matter where the animal came from. I joke a lot that I had no idea what I was doing when I adopted Shiva and it's true. I didn't. But I was prepared and committed to take on the responsibilities of a dog, whatever they may be. While I had no idea her behaviour issues were as large as they were before I signed the adoption agreement, I knew that my signature meant something and I wasn't going to go back on that, no matter what problems we faced. Bella is such a beautiful dog. That photo shows what a sweet girl she is at heart. Thank you for being so willing to take her on and for not giving up. Hey, I totally agree. One would read my blog and think all rescues were horrors, but like you, I chose them knowing their issues, because I wanted to help. None of the shelters or rescue groups I've dealt with have ever tried to intentionally hide anything about any dog I've been interested in. There are many, MANY wonderful dogs out there with absolutely NO behavioral or health issues - puppies, purebreds, mixes alike - I wish more people would consider rescue FIRST. And you said you had nothing to say. :-) That was a beautifully written post. I often times find myself trying to convince people not to get a dog because I am concerned about their commitment to them. It is a lot of work and one a responsible breeder or rescue will tell you. It's getting rid of the irresponsible ones which will really make a difference. I can't agree strongly enough with stopping irresponsible, and unwanted, breeding. I get that accidents happen but if I see one more person deliberately trying to breed their mixed breed dog, I think I'm going to lose it. I like your approach to the commitment it takes to raise a dog. Whether you know everything it will entail or not, the choice to bring a dog into your home is making a commitment to stand by that dog through thick or thin. Even a well-bred purebred puppy can grow up to have issues. There is never a guarantee with a living being that has a mind and a will of their own. Absolutely wonderful post - shelter dogs, just like other dogs, are diverse. Some (from both groups) will have issues, some will have none. As such, generalizing is useless - each experience will be different but has the potential to be life-changing and rewarding. The story of your time with Bella is ample evidence of that.